You’d always hope that governments aim to minimise spending waste, and part of that is forward planning, so for instance you don’t do upgrades to something that is about to be replaced. 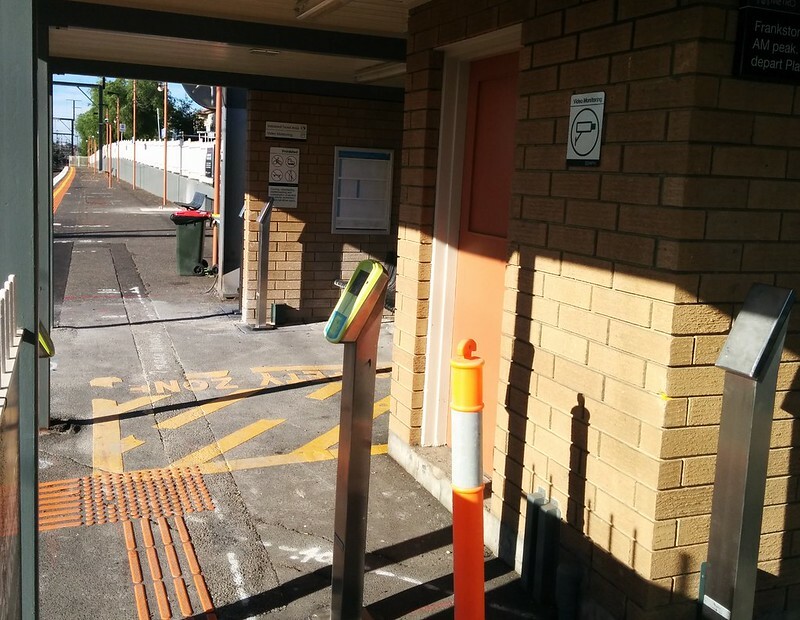 Our local station at Bentleigh has received numerous upgrades over the past year or two. Some are part of the $100 million Bayside Rail Upgrade (initiated by the Coalition in May 2013), some are part of bigger rollouts across the rail network. But in coming months the station will be completely demolished as part of Labor’s level crossing removal, meaning a lot of wasted money on infrastructure with a very short lifespan. Other stations such as Mckinnon have also been getting similar upgrades, but for the most part they have wisely not installed lots of new upgrades at Ormond (which the Coalition included in their smaller level crossing removal program announced in August 2014). Here’s a timeline. 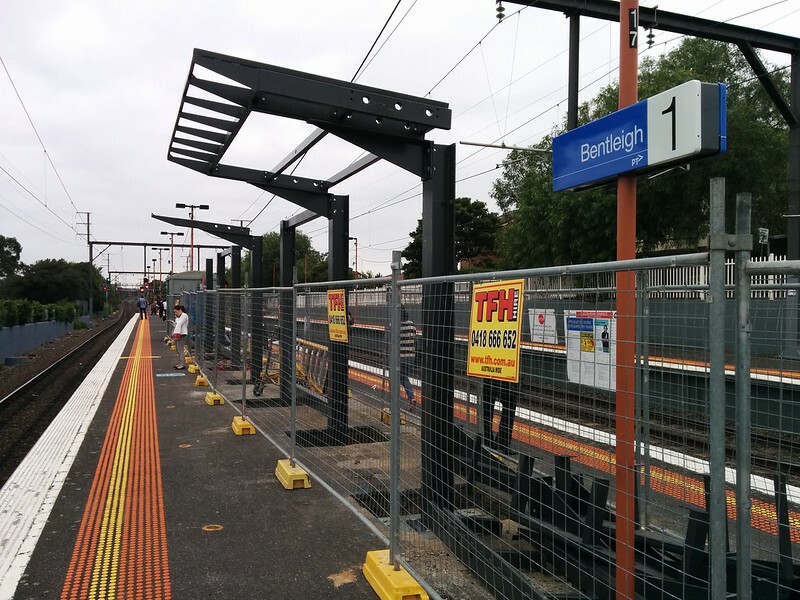 This lists just the upgrades at Bentleigh station. Many other stations to be demolished have got similar upgrades — and numerous less visible upgrades have occurred that aren’t at stations. Also in May 2013, the PSO pod was built next to the station. It would be demolished less than three years later, in December 2015. PSOs start duty at Bentleigh. The station is repainted — as per the old Red Dwarf gag, perhaps it was a change from Ocean Grey to Military Grey? 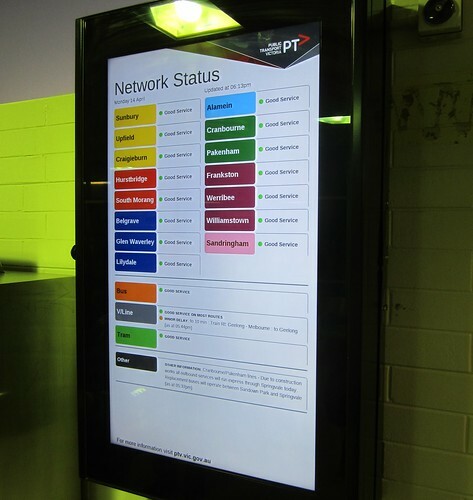 A “rainbow” status board is installed, one of a handful trialled initially ahead of a wider rollout. Passenger Information Displays (PIDs) installed on platforms 1/2 — very handy; it provides a countdown timer to the next train without having to use the Green Button, and unlike the Button is usable by those with hearing difficulties. 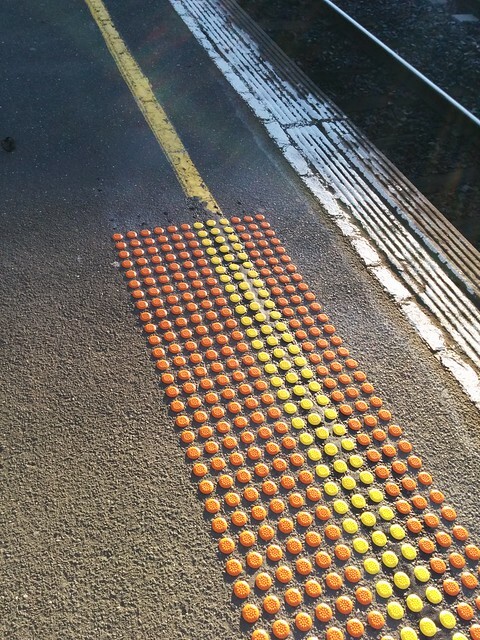 Also in May 2014: tactiles installed along the platform edges. Coalition announces funding for Ormond (and 3 other crossings) to be grade separated. Labor pledges to grade separate the Bentleigh crossing if they are elected in November. At this point, there was no firm timeline for grade separation at Bentleigh, other than sometime in the next 8 years — though the smart money was on it being done before the 2018 election, so it was likely that anything added from now on would have a pretty short lifespan. Pole and shelter installed for a PID on platform 3 — the PID itself has never turned up, so this structure will eventually be removed having never been used. It’s assumed that some works to wire up the PID were also done. Here it is pictured in February 2016, level crossing construction underway. 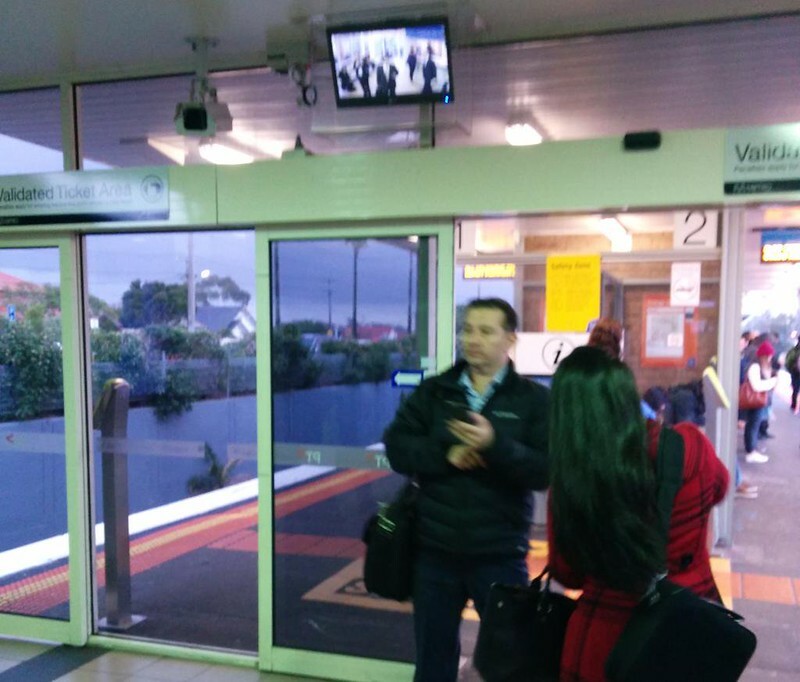 Extra Myki readers on platform 3, and widened exit gate — this was a bottleneck for years. New platform markings and tactiles indicating wheelchair boarding places. Additional shelter on platforms 1 and 2 — useful for helping people spread along the platform when it’s wet, though the height of the shelter means rain that’s not strictly vertical still tends to get in. 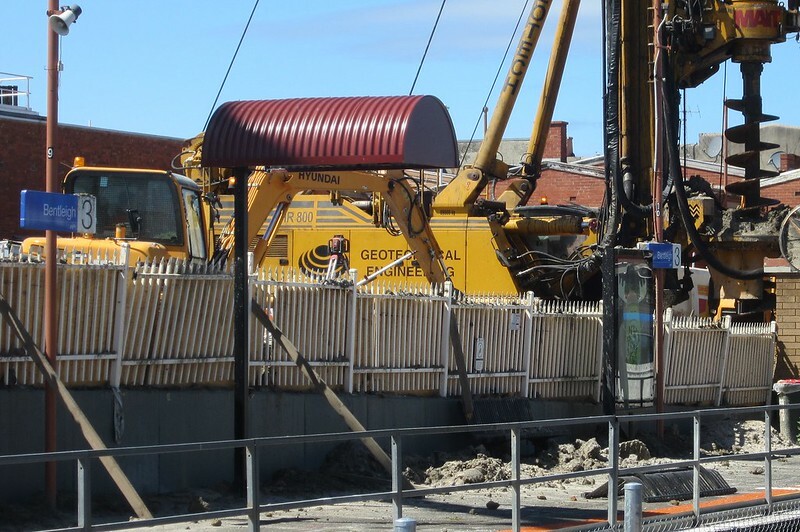 The state budget provided $2.4 billion in funding for Mckinnon and Bentleigh level crossings to be grade separated at the same time as Ormond (as well as funding for others; a total of 17 crossings in all). 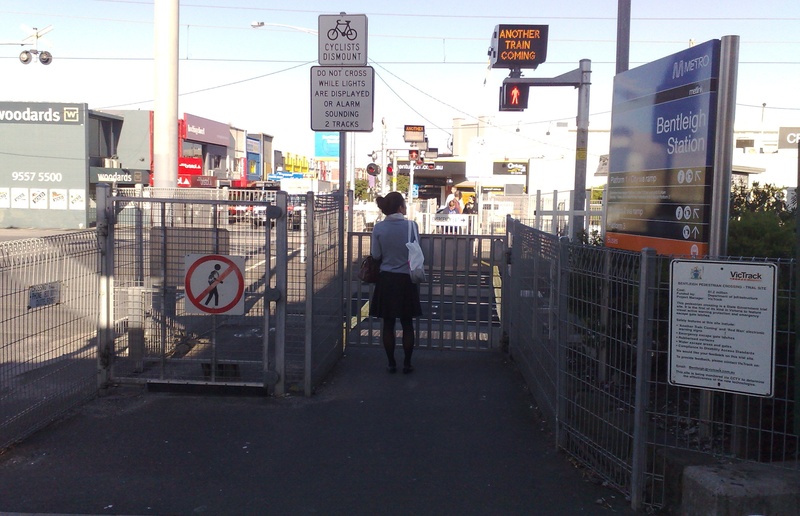 From this point, it may have been wise to pause upgrades at Mckinnon and Bentleigh, but they kept coming. 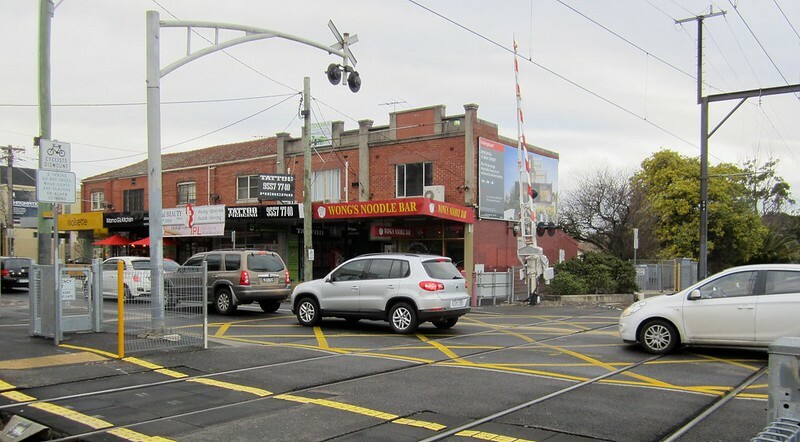 The Bentleigh level crossing got cross-hatching — even Ormond got this, and since then it appears to have popped up on numerous crossings around the network. One would hope it’s now standard on all level crossings, and not too expensive to implement — though it’s not a cure-all for cars queuing on the crossing. 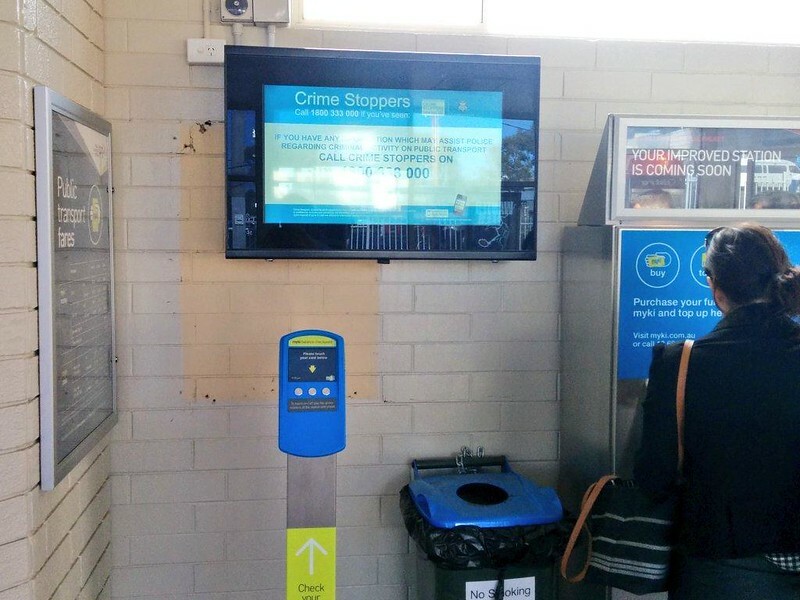 New CCTV monitor in the station waiting room. Over the last couple of years, other (less visible) changes included upgrades to power/overhead wiring (not that you’d know it today), signalling, station lighting and CCTV, track, and reprogramming of the level crossings (to cope with faster acceleration of X’trapolis trains) — all of these upgrades have occurred right up and down the Frankston, Williamstown and Werribee lines. The PSO pod (built in 2013) and the Parkiteer (built in 2009) were demolished. The rest will come down in due course. 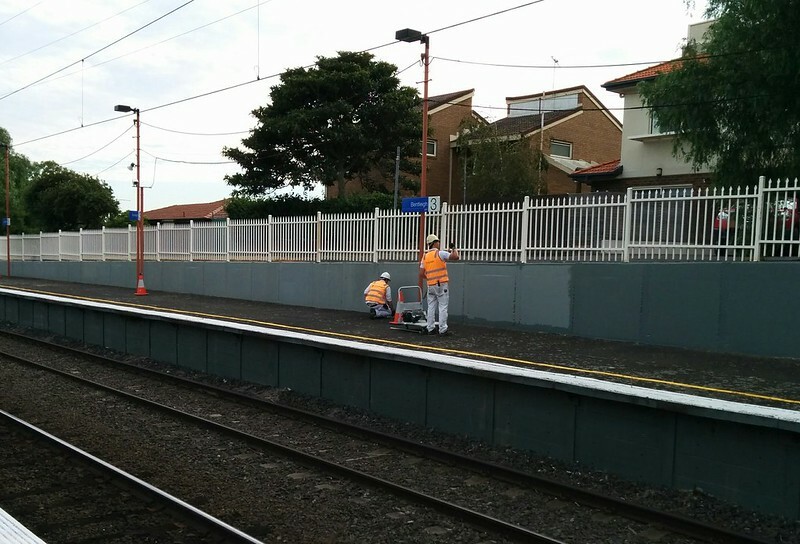 At Mckinnon, platform 3 has already been demolished — including new fencing from earlier in 2015, and extra Myki readers and PIDs added in the last few years. 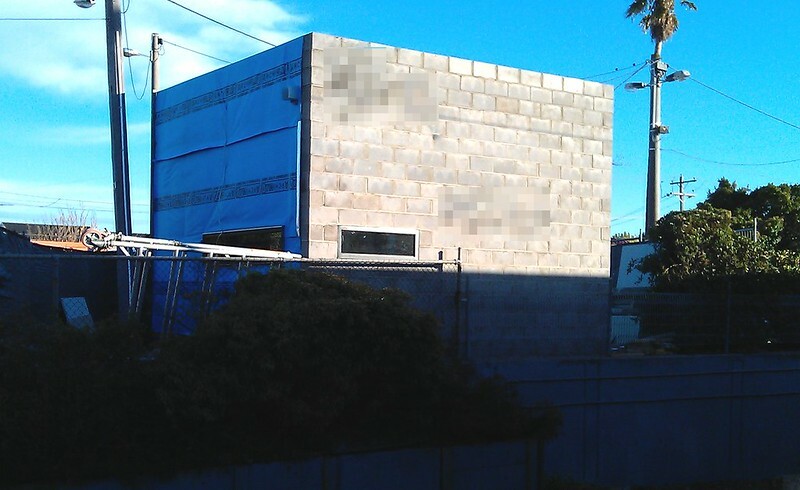 Bentleigh, Mckinnon and Ormond will all be completely demolished by mid-2016 for rebuilding in their cozy new trench. I’m told the extra shelters can be fairly easily moved to other stations, which is good. But what of the other changes? Some of this gear is pretty expensive. For instance you can’t put a conventional TV screen in a public area. It needs to be industrial-strength, so the same design can go into an unstaffed station. The cables can’t run across the floor, they have to be properly secured. Some equipment needs to be installed outside train operating hours, so you have to pay the staff overnight penalty rates. Or you might need additional staff as lookouts for safety reasons. Some upgrades, particularly to signalling, track and power, need to be done during a planned train service shut down, costing even more money. How many thousands of dollars worth of improvements, varying from brand new to only a few years old, will be lost during demolition? How many other stations could have had those upgrades instead? Of course, the timing was such that some of the upgrades happened before it was known when the station would be demolished. But it underscores that forward planning really isn’t our forte in Victoria. I’m certainly not saying I don’t welcome the level crossing removals — they have a lot of benefits — but it shows how politics intervenes to produce these types of outcomes. 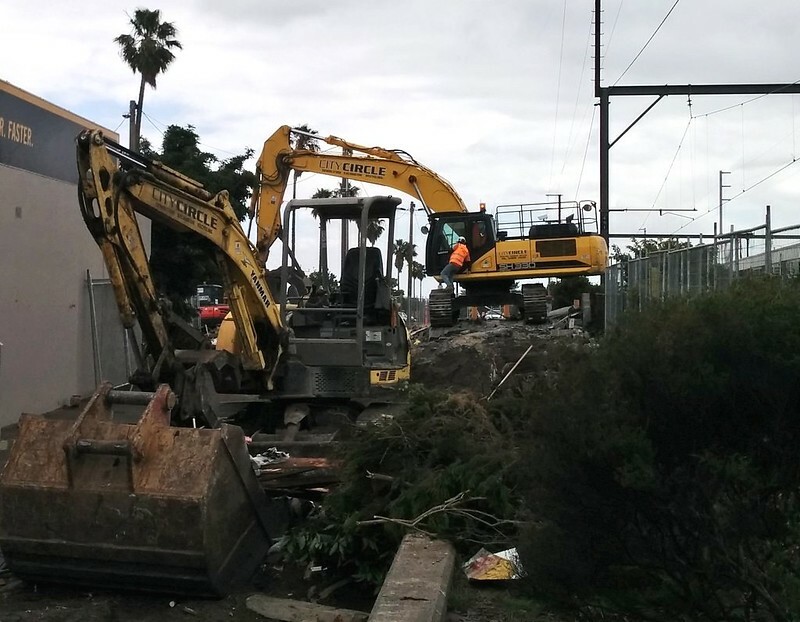 The Bayside Rail Upgrade project has been usurped by the Level Crossing Removals. And so the ship of state turns to lurch in a new direction, at the inevitable expense of taxpayers. Next → Next post: How many tracks? On little used country branch lines, when a station received a new coat of paint it was a sure sign that the line was about to be closed. And maybe there will be more money spent later on when some folks decide double decker trains are to be used, or another government wants to put three lines (an express down the middle). 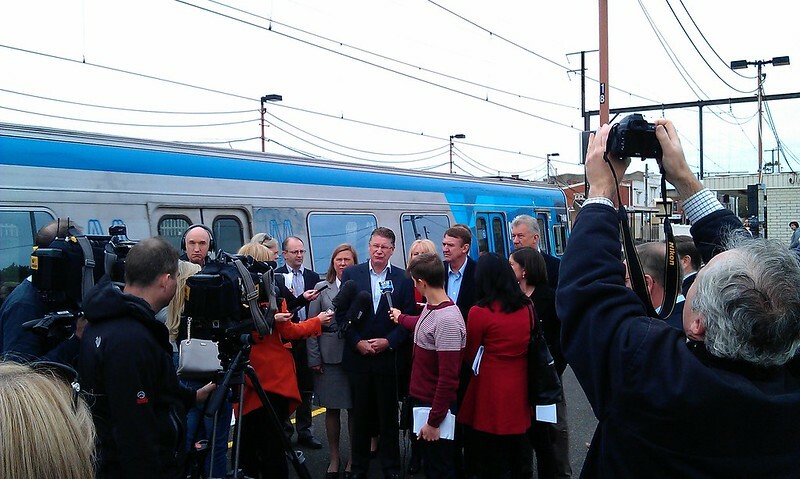 the Bayside Rail Upgrade was a project from the previous government. Hence the current government’s need to remove any traces of this former initiative. At the very least the electronic signboards (network status, crime stoppers, etc) can be moved and recovered (with the exception of labour on installing them). It’s a shame the public service looking after all of this acts on the whim of politicians. I still remember when the newly built footbridge over Footscray station had to be partially torn down and rebuilt because of the RRL upgrade. If only they had put in future provisions in that bridge. They could’ve built Southland station a few times over. Heatherdale station is due to be demolished, even though the current station buildings only opened with EastLink (2008?). As you’d know, Mitcham was put in a huge trench a couple of years ago. Just a few months before they started demolishing the old station they were still doing repairs and upgrades to the pedestrian walkway shelter. Separately, Mitcham Road level crossing was extensively re-laid about six years ago, all to be ripped up within four years. What a %^*%$ waste. Why can’t we have some long-term planning? Arfman mentioned the possible recovering of infrastructure. I can assure him, at Ringwood, a year ago, the contractors had no hesitation in smashing to rubbish the recently built wheelchair shelter at the UP end of the island platform. Could have easily been re-used somewhere, like at the Down end of Plat 3 where we now have a ‘shelter’ that is wonderfully open to the south-west rain – ducks are going to love it. Yes, Heatherdale station was only rebuilt in 2007 or so for a good few million dollars, while the wooden sleepers were replaced with concrete in 2013-14. A PSO building was also installed a bit later, as the station had no provision for anyone actually using it besides a part-time station master (host stations, what a complete waste of time). One wonders if the new station will be staffed or not. I will add this though, the rails themselves were never replaced, only reprofiled with a rail grinder – the ones in the pit are from the 1980s (the wooden sleepers, before replacement, had Pandrol clips holding the rails instead of dogspikes), while the ones toward Eastlink are from 1957, complete with some jointed (non-welded) sections which now make a nice bang over the “new” concrete sleepers – which will most likely be destroyed rather than recycled for use on other parts of the network, because that’s how our throwaway society works these days. The railway line beyond Leongatha had all of its sleepers replaced, six months before closure, and there was rumors of it being closed at the time of the works. I do not mind if it is a portable device that will be reused, either in the new works or located elsewhere. But as posted above, the odds are it would be scrapped on site. While the old Liberal party govt, could forsee the grade separations at Bentleigh in the short term, it would have been best to just wait for that grade separation to happen first. I can understand even now, those beyond Mordialloc are really too far into the future to wait for. What is the current status of the bayside xtrapolis project? In part, it could be the ‘lack of confidence in getting funding for the future projects’ therefore why are we going to wait for it to happen. Mentone Station cannot be demolished because the Edwardian building and the gardens on the up side are heritage listed. Because the main station building is a wooden structure, it could be removed and replaced, perhaps in a different place. Pop a new station underneath and put the building back as a cafe, nicely set in gardens. It could have, and should have, been that easy, but some numpty allowed a 5 storey apartment block with a 3 storey basement carpark to be built on the other side of Balcombe Rd. I hope I’m wrong about the space left down of the current tracks being not enough to temporarily slew the lines onto during construction. Before that, the site was abandoned brownfield industrial on that side, and carpark on the other side of Balcombe Rd.